A mirror is always provided above the bathroom vanity. It sometimes doesn’t have a frame or we called it a frameless mirror. The frame is supposed to support the mirror and decorate it. 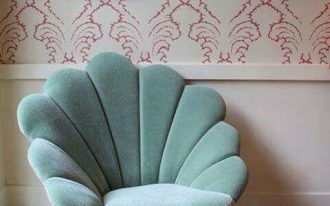 It often has a decorative frame with some colors and pattern. Mirror frame can be made of wood and iron. The material may create a different result. 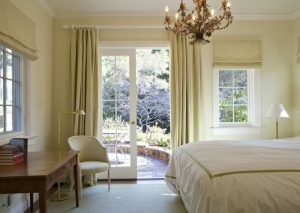 The wooden frame has a minimalist design while iron frame for mirror often gives an art design. Iron can be shaped to make a pattern and unique rustic form for the mirror. So that is why many people try to get a mirror with iron frame. 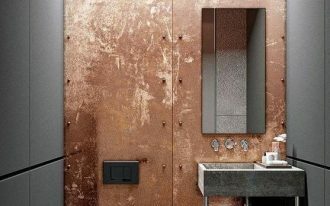 The following are some amazing iron mirror frame ideas for your bathroom vanity that will complete your bathroom features. 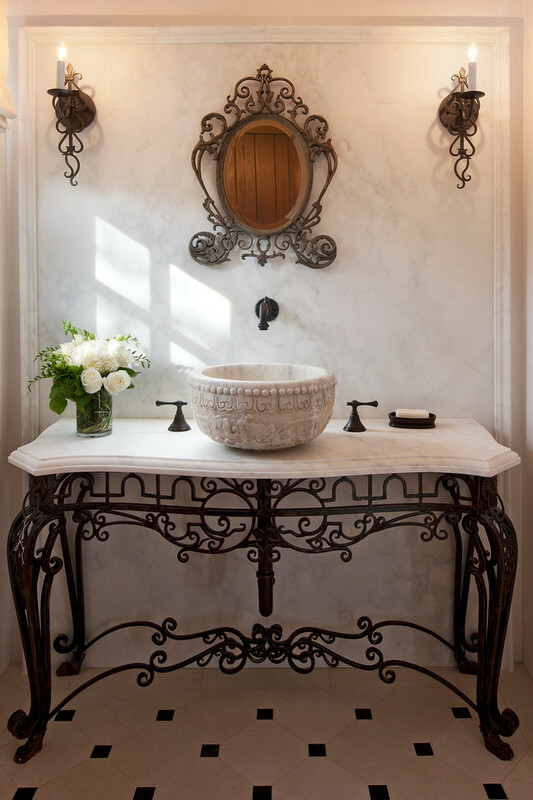 This corner is filled with iron features such as the black iron vanity legs, iron wall sconces, and the iron mirror frame. 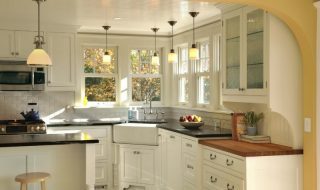 It looks really rustic and elegant with the repurposed antique bowl and marble countertop. 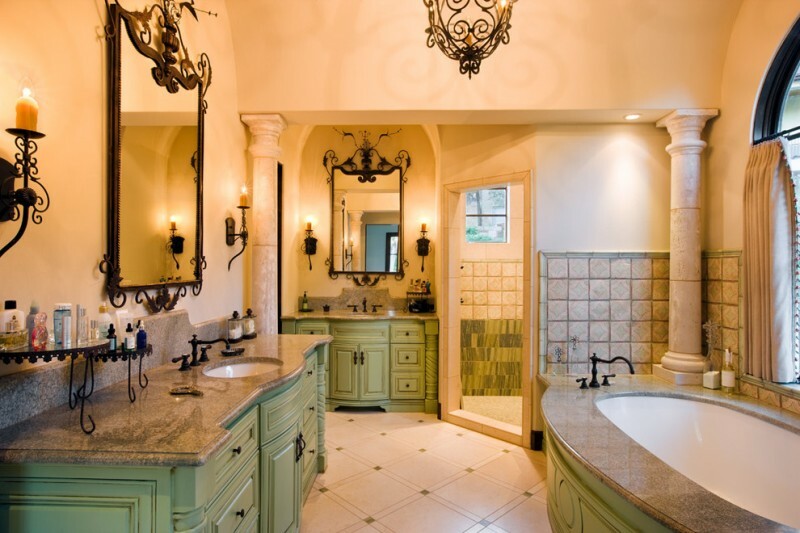 This bathroom vanity shows the Mediterranean backsplash and countertop tiles with some iron features. 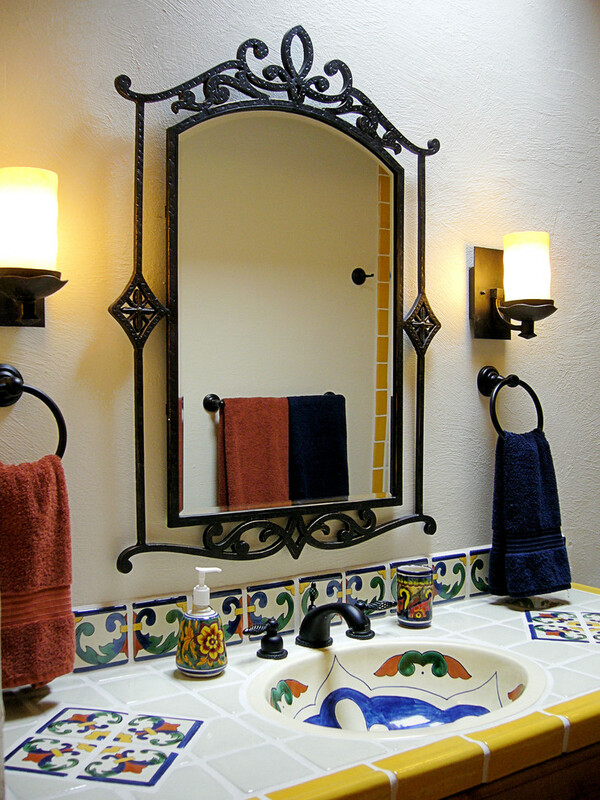 The mirror frame, the wall sconces, and the towel rings are made of iron with nice rustic details. 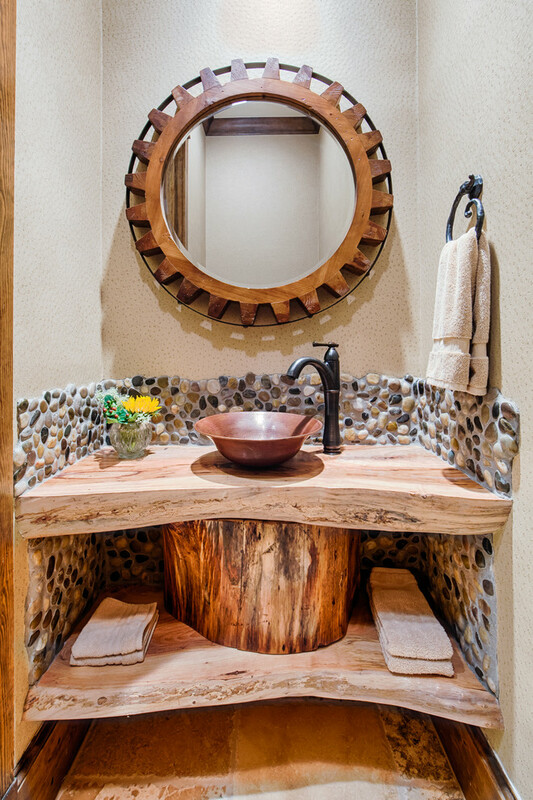 The vanity features in this bathroom use the combination of wood and iron materials. This combination gives an industrial vibe in this space. The round mirror also has the combination frame of wood and iron. The porcelain subway tiles with a brown and green glass mosaic border create a neutral backdrop for the cool damask wall covering and the beautiful wrought iron mirror above the wooden vanity. 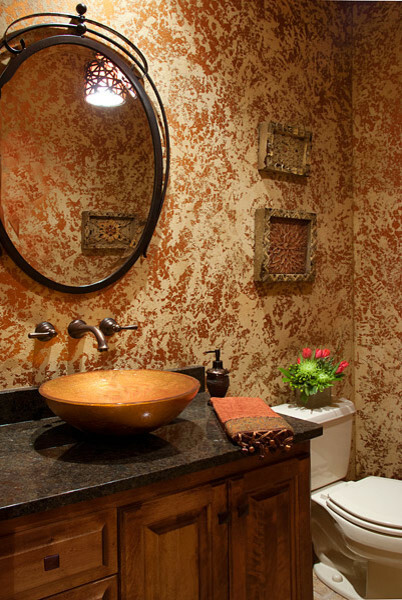 The decoration and features in this bathroom really set the tone. This glamorous vanity features black marble backsplash, sink, faucet, wall sconces, and a mirror. The mirror has the iron frame with minimalist detail. 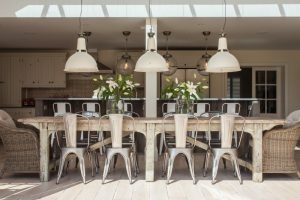 Too much wood material that may be boring can be avoided by adding some iron features. This wooden vanity is placed below the round mirror with iron frame, wall sconce, and a towel ring. 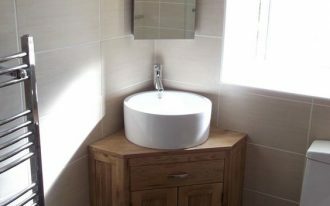 Lighter walls are suitable for a bathroom if you have decided to have dark vanity and dark flooring. 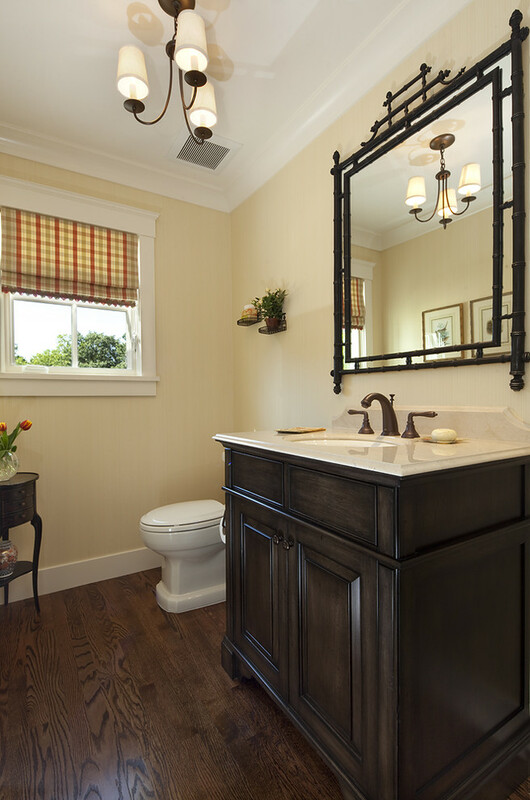 The dark wooden vanity is completed with a sink, granite countertop, and a rectangular mirror with black iron frame. 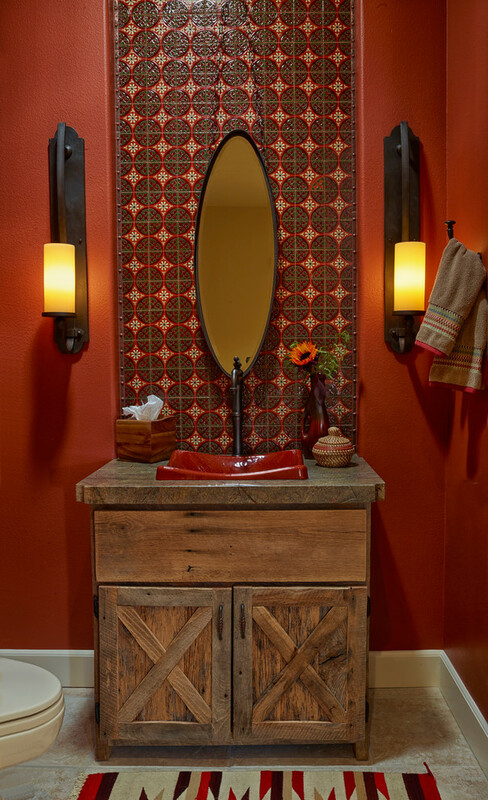 The red painted walls with red patterned accent wall become a nice background for the black iron candle sconces and the oval mirror with iron frame. 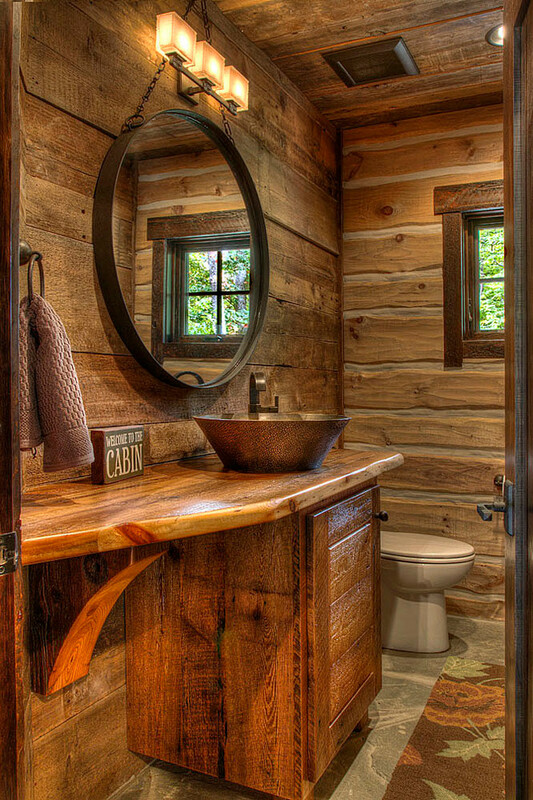 The wooden vanity with a red sink gives more rustic style in this bathroom. 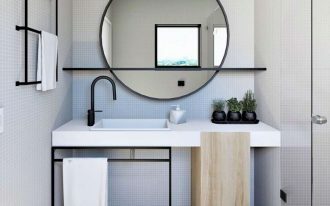 The vanity space in this bathroom features a wooden vanity, black granite countertop, wall mounted faucet, a sink bowl, and a wall mirror with iron mirror frame. 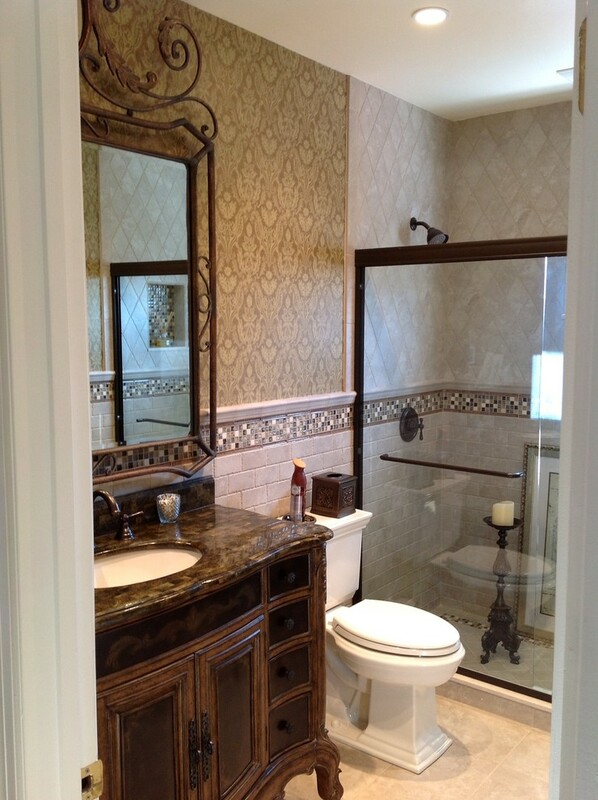 This large bathroom provides two vanities with the same features but different in size. 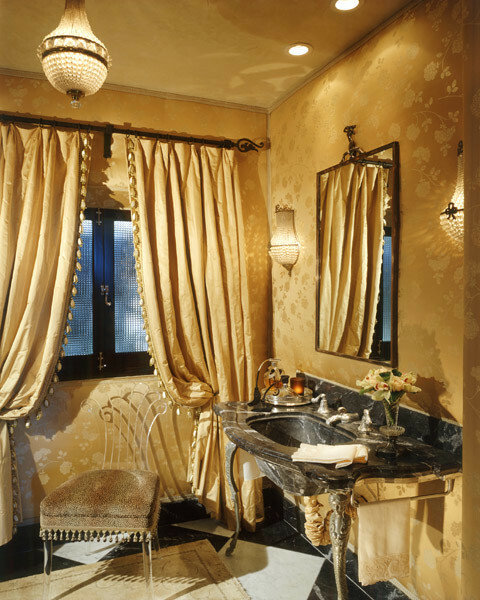 It is also decorated with iron accessories of the iron mirror frames, chandelier, and the wall sconces.